Dental bridges connect two or more teeth and span the space of a missing tooth with an artificial tooth. Bridges are made of porcelain with a metal substructure or with an aesthetic white zirconia substructure with porcelain over it or lithium disilicate. The bridge fills the gap of missing teeth returning your smile to its natural beauty. A dental bridge attaches to the surrounding teeth or to dental implants via dental crowns, inlays or onlays, or wings that attach over or to the back of your teeth. The artificial tooth is connected in between these two connections. There are many benefits to a dental bridge. Besides the restoration of your smile, a dental bridge will also help you properly chew and speak. Your natural bite is restored and the shape of your face is maintained. A dental bridge will also prevent your remaining teeth from drifting out of place. Dental bridges are easy to care for and will last for many years with proper care. 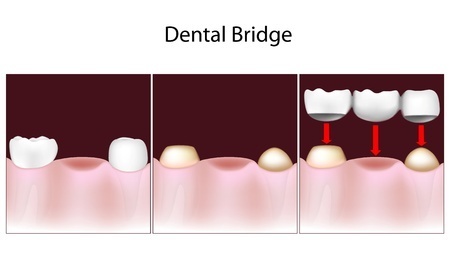 Dr. Ho has several choices in bridges and after examining your mouth and discussing your options he will decide which type best suits your needs. During this visit the abutment teeth are prepared. This may involve recontouring the teeth affected by removing a portion of the enamel so that a crown may be placed over the teeth. Next digital images are taken of your teeth and surrounding tissues. Then your bridge is fabricated in our office at that appointment. Once your new bridge is in place it will look and feel just like your natural teeth. The color of your bridge will match your teeth, and your bite will be corrected. You will have a new healthy smile that will last for many years. For more information on dental bridges in Austin, Texas, contact Westlake Hills Dentistry today. Our offices are equipped to provide an array of restorative procedures such as porcelain veneers, dental implants, composite bonding, and tooth-colored fillings.